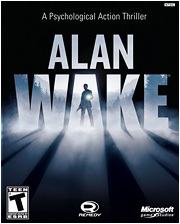 Alan Wake chronicles the curious case of writer Alan Wake, who, stricken with a bout of severe writer's block, takes a sabbatical with his wife, Alice, to the idyllic Washington town of Bright Falls. And, as I'm sure you've all already guessed from a survival horror game taking place in an idyllic vacation destination with a cheery name, the majority of the game has Alan searching for his missing, possibly dead wife. This search is impeded severely by the fact that the game opens in a vivid prophetic nightmare that Alan is having and that after his wife's disappearance and/or death, he blacks out and loses a week, waking up with his car wrapped around a tree in the dark forest. Combined, these two events serve to make you completely unsure what is reality and what is just a broken writer's imagination taking over. The combat in the game is exactly what survival horror combat ought to be: difficult, overwhelming, and not always worth the loss of ammunition. Sometimes it's better to just cut and run. Another feature of the game is how Alice's fear of the dark (If it seems like it took me a while to get to that fairly important plot point, then I'm doing a better job representing this game than I thought!) is manifested in the town by all of the enemies (seemingly possessed villagers) being coated in a layer of liquid darkness. Luckily, Alan (usually) has a flashlight that can be used to burn away the shadows and make them vulnerable to bullets. The cast of characters in the game are full of some pretty interesting, if terrifically shallow, denizens of the town, more than a few of which seem to be after Alan due to a manuscript that he apparently wrote during a blackout. The manuscript seems to be describing the events of the game that have happened, are happening, or are about to happen, providing backstory as well as motivation for some of the non-inhuman villains of the game. If it seems like I haven't stated whether or not the game is enjoyable, it's because I'm a little unsure myself. Much of the game involves needless walking through dark forests at night, going out of your way to collect manuscript pages, coffee thermoses, and information from signs strewn about the town. On the other hand, the gameplay is fun, the radio and TV shows you can stumble across (especially Night Springs, a Twilight Zone homage) are quite entertaining and give a lot of explanation of the precepts of the game. It's not the best survival horror game, and the thing is marred by an incredibly huge plot hole ( why does he have to make a trade to get his wife back from the evil entity that took her when the entity never gave him anything in return for her?) but it was worth a Gamefly rental at the very least. Maybe next time rate the video and audio quality. Those are very important in my judging of Horror games. Otherwise it was an engaging and personable review. I love this game, I think its great, Specially considering the lack of decent survival horror games these days. First thing is the combat, which didn't explain that even if you do run all the "possessed" people run faster then Alan. The biggest issue is Alan can only sprint for a short time, which is fine considering he's not an athlete, or a soldier, he's a guy who makes a living behind a typewriter. But when you're trying to get away, and you think you've gotten some distance on your foes just to get whacked in the back of the skull with whatever they're carrying and find that they've still right up behind you, well, that's a little annoying. Couple that issue with the fact that your dodge button is tied to the same button you'll be trying to sprint with and you'll quickly notice how frustrated you are that your wasting your breath ducking and weaving when your trying to just flat out get away. It gets pretty frustrating. Second thing is the last paragraph makes the game sound like all our doing is collecting things, which isn't entirely true. Sure, you'll be picking up the things mentioned, but you'll only be going out of your way to do that if your an achievement whore (which I'm a card carrying member). This game is more about the story then any thing else and it's perfectly plausible to get the full experience of the game without collecting any of the things the achievements ask for, the things being asked for only really add flavor to the game and its environment. The plot hole mentioned, to me, didnt seem like a big deal, specially when there are 2 more "episodes" (the game is broken down into what appears to be TV episodes, like your favorite TV show, which i found was a great idea instead of the regular level or free roam formats) that are supposed to explain more about whats going on with Alan after the end of the game proper (I've played The Signal, but haven't played The Writer yet -It hit XBL on tuesday and I downloaded it last night). I thought the sound quality is pretty amazing. The atmosphere of the game is very very dark most of the time and the sound plays an important role in the scares you'll encounter. I'm not at all reluctant to say that I jumped pretty high when looking around, with no possessed guys coming after me yet, and had what i figured was a racoon knocking over trash cans. The sound and the event were timed so perfectly that even a seasoned vet like me was startled. The voice acting is also pretty great, but some character (well.. really only one) might grate your nerves -but only because the characters personality calls for it. The games video quality is mixed. It does the darkness (which is the bulk of the game) great but when it comes time for the sun to be out it gets a little grainy. The only problem I had with the darkness portions was that, even with the best flashlight, it was impossible to see sometimes, which I suppose was supposed to add to the atmosphere that Alan was kinda screwed. I'm glad you guys enjoyed the review. It didn't occur to me to do audio/video quality because those aren't really things I tend to focus on in a game (I crave the story and gameplay) but I'll definitely keep it in mind for future stuff I write for the site. In terms of my last paragraph implying it, it's because I felt that, when you're not immediately in a combat, all you are doing is walking around in startlingly linear dark forests. Outside of the occasional branching path that just leads to a collectible or a supply chest (which are also collectibles in the stats menu, by-the-by) and then you have to turn around and resume down the first path, there's little to no exploration available in the game. And you really do have to look for the manuscript pages to get the full enjoyment of the story. I thought it was a great game, Remedy knows how to tell a story. I just watched a horror anthology show from 2008 on Netflix called Fear Itself. One of the episodes, The Circle, is the plot of this game almost entirely. Remedy may know how to tell a story, but it's someone else's story.